Move over Atlantis – a more luxurious sister property is about to join you on the crescent of The Palm Jumeirah. 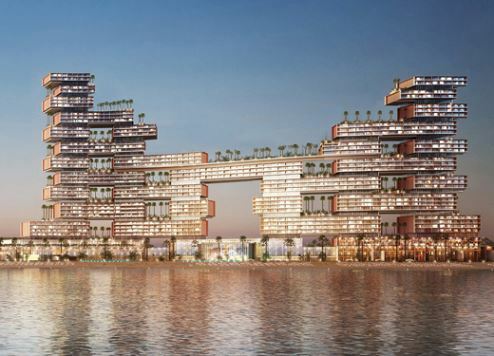 Operating company Kerzner International has announced the launch of The Royal Atlantis Resort & Residences, which will be located adjacent to the existing mega resort on the famous man-made island. Destined to become another Dubai icon, this striking modern property will be home to 231 residences and a hotel with 795 guest rooms and suites, occupying some 10 hectares of land on The Palm Jumeirah. Once completed in 2019/2020, this luxury development could hit the record books with management revealing it will feature some 94 swimming pools – surely the most pools of any property worldwide. This will include a 90-metre sky-high infinity pool experience, as well as individual pools for some of the hotel rooms and residences. Another stand-out feature at The Royal Atlantis Resort & Residences will be a water, light and fire show developed by water feature creator WET, the company behind the Dubai Fountain experience. This is expected to become a tourism attraction, popular with guests and visitors alike. Issam Galadari, director, The Royal Atlantis Resort & Residences, said the project would “build on the success of Atlantis, The Palm”.